Many settlers traveled to the American colonies for freedom of worship. Quakers, Puritans, Jews, and people of other faiths arrived to create communities in what would become the United States. 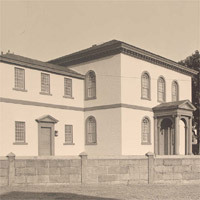 On December 2, 1763, members of the Jewish community of Newport, Rhode Island, witnessed the dedication of the Touro Synagogue, the first synagogue in the American colonies. The synagogue was named for Isaac Touro, its first officiating rabbi. Touro became the center of a thriving Jewish community.